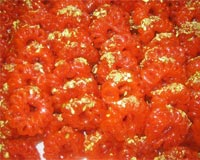 Imarti is a traditional Indian sweet. Prepare sugar syrup of one thread consisitency. Grind dal using water to make thick batter. Mix 2 tsp saffron colour to the batter. Beat the mixture properly to make it smooth. Pour batter in Imarti nozzle. Heat ghee and form Imartis in it. Fry it till it turns crisp from both the sides. Dip them in sugar syrup. Remain them soaked in syrup for 5 minutes. One of my fav sweets thanks 4 sharing. hi i m davinder,,i have given near about 15 recipes these all r delicious yummy just try for all one by one and vote for this because i used only healthy material in this .